During my twenties, I thought leadership was all about me. And for a while, it was. As a twenty-six-year-old Berkeley student, I had the audacity to believe I could start a company, raise millions of dollars for it, and make it successful. Looking back, I must have been insane. I'm not sure how, but I managed to convince some serious venture capitalists to invest millions of dollars in my dream. In doing so, I promptly discovered just how far in over my head I was. I had no business experience, I'd never held a full-time job, and I didn't even know what I didn't know. I was in serious trouble. I was also committed. Fully. So I worked as hard as I could - 90 hours a week, every week, for four years. One week we'd be on the edge of phenomenal success, and the next week we'd be on the brink of failure. This pattern repeated itself, through three rounds of funding, two strategic partnerships, and four failed attempts to replace myself as the CEO. It was quite the ride. When the company crashed and burned, I took the loss very personally. I'd made a lot of promises to a lot of people - investors, employees, customers - and I felt that I'd failed them all. It wasn't just that the company had failed. I had failed. Because, of course, it was all about me. I had more success with the acquiring company. After taking a few months off to recover, I moved into a position in which I had influence without responsibility, and a reasonable work load. I was told not to waste my time on investors, and then I snuck out and raised $10 million anyway. It was like bringing home a puppy. "Look what I found! Can we keep it?" It was still all about me. My achievements. My responsibilities. The number of people I was managing. The money I had raised. The company gains that could be traced back to me. Leadership was about one thing - me. Thankfully, the CEO of the acquiring company was a lot older and wiser, and one day he sat me down for a performance review. I don't remember the exact words, but it basically went like this. "Brian, you're smart. We are so impressed with how smart you are. You are really, really smart. AND, you would be so much more effective if you could learn how to at least occasionally listen to what other people have to say." His feedback brought me up short. Ouch. I'd been treating leadership as something I do to people rather than do with them. I'd been equating leadership with "being the hero" - always having the right answers, being the smartest person, putting in the most hours. And for the first time, I wondered if there might be a more effective way. As an executive coach, I've encountered many leaders who think that leadership is all about them. It's their job is to be the hero, to be in control, and to make everything work out. "How good am I?" "Do I know enough?" "Am I making enough money?" "How can I come up with the right strategy?" "Am I making the right decisions?" "Do people respect me?" "Do I have enough power?" 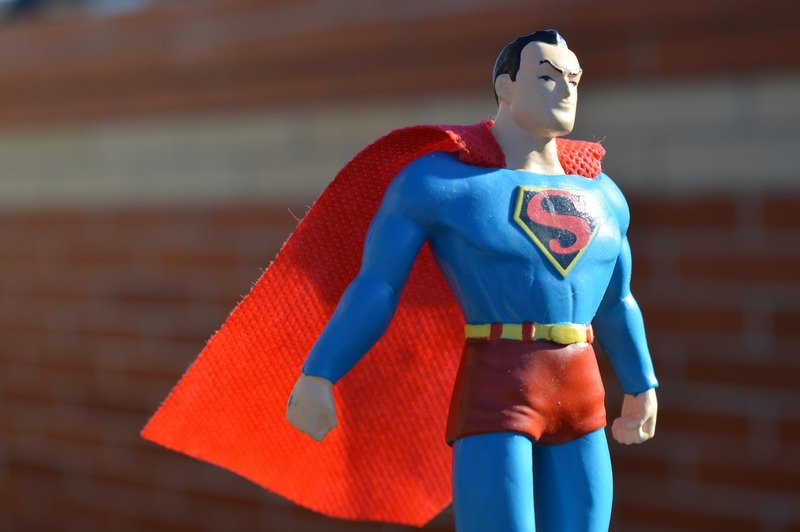 These are typical questions Heroic Leaders ask. In contrast, Authentic Leaders focus on the purposes they support and the people they serve. This isn't to say that they're martyrs, that they're weak, or that they're never thinking of themselves. Authentic Leaders build strong relationships that work for everyone. They build relationships based on Win/Win or No Deal. This requires a great deal of courage and self-discipline. In a time of brutal competition and blistering change, Win/Lose thinking is almost automatic. "It's a dog-eat-dog world out there." "We need to beat our competitors and take their market share." "Business is war!" 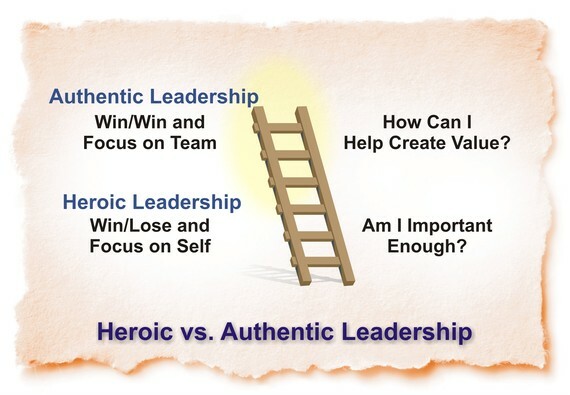 From this perspective, Heroic Leadership just seems to make sense - life is a battle for survival and self-importance, and stress is the automatic price of success. This wouldn't be so bad except that heroes are always supposed to be able to conquer their fears. They're taught to have the courage to conquer (which starts with determination), but not the courage to change (which starts with acceptance). Acceptance is the foundation of lasting change. Yet this is the last thing that Heroic Leaders are trained to do. These days, conquering the competition is much less important than keeping up with the exponential pace of change. If you're a business leader and you're not alarmed by how fast things are changing, you should be. It's become the primary challenge of leadership. And Heroic Leadership is the opposite of what's required to deal with it. Authentic Leaders are in the business of change. And that means playing a completely different game. The job of a Heroic Leader is to have the right answers. The job of an Authentic Leader is to ask the right questions. Heroic Leaders worry about their level of importance. Authentic Leaders focus on their level of contribution. Heroic Leaders think life is a battle. Authentic Leaders live in a world of Win/Win or No Deal. And they tend to be extraordinarily effective. James Burke was the chairman of Johnson & Johnson in 1982, when seven people died from taking Tylenol capsules that had been pulled off the shelf of a Chicago store, replaced with cyanide, resealed, and put back for someone to buy. Suddenly, his company's products were being blamed for people's deaths, though the actual cause was entirely outside of his control. Burke could easily have gone on television and blamed the unknown criminal. He could have limited the recall to Chicago. He could have treated the problem as a Tiger, surrounded himself with lawyers, and done everything he could to protect his company's short term profits. But he didn't respond that way at all. Burke didn't assume he had the right answers. And he didn't jump to attack. Instead, he pulled together a seven-person strategy team and asked them to answer two questions. First, "How do we protect the people?" And second, "How do we save the product?" As a result, the company instructed the nation to stop consuming the product, pulled every bottle of Tylenol from every store in the country, and issued a recall that cost them $100 million. They created triple-safety packaging, communicated their actions, and then re-released the product once they trusted it was safe. Because of this, the company took a short term hit and created a long term success. They were able to both protect their customers and save a $350 million-per-year product. What could have been the end of their good name established their brand as supremely trustworthy. They turned an existential crisis into a Win/Win. That's the power of Authentic Leadership. Authentic Leadership may sound naïve, idealistic, or unreachable. Not so. It's one of the most powerful forces on earth, and it's something anyone can develop. Walking the journey of Authentic Leadership can be complicated, but finding the path is simple. It merely requires a reliable guidance system - the ability to find and follow your Yes Yes Hell No's.